Once Procare is installed you’ll want to log in as the “Default Administrator” and begin setting up your information. The “admin” account belongs to the System Supervisor User Group and may access any part of the program. Items that require a System Supervisor are denoted by a shield throughout Procare. Dbl-click the Procare shortcut on your desktop. Type “admin” (lowercase, no quotes) for your Username. Type “admin” again for your Password. Click Login (or tap Enter on your keyboard). You’ll be prompted to change your password. Enter your Current Password (the old one) of admin. 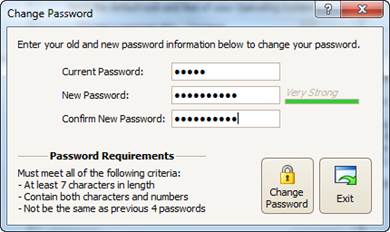 Enter a New Password, then Confirm the new password. Click Change Password and you’ll be automatically logged in as the Default Administrator. Important! Your Username is still “admin”. You may be required to select your personal Security Questions. If you later forget your password, you’ll be able to reset it by answering the questions. Then you’ll be prompted to Register the Software, unless you have a Procare Cloud account (see note). Choose to register online or by phone, then click the Register button. Congratulations! Your software is now installed and registered. Note: With a Procare Cloud account your registration is handled in advance by the Procare staff. The Setup Wizard will start automatically. Then you’ll want to learn about Getting Around Procare. How do I log on the very first time?